What fun that Thanksgiving and the beginning of Hanukkah are converging this year! I feel so blessed to have been invited to a dinner where our backgrounds cross paths and we all get to break bread as thankful Americans. Our hosts allowed as how this would be a traditional Thanksgiving menu but, when I was asked to bring appetizers, it seemed like I could be somewhat creative with a nod to a traditional Jewish meal of lox and bagels. 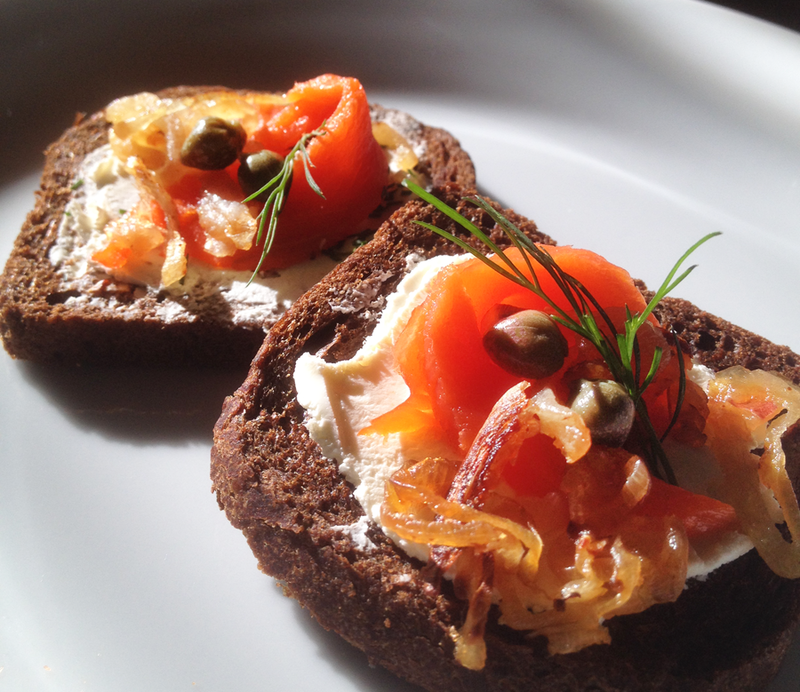 Instead of bagels (after all, this is an appetizer) I'm using small loaves of pumpernickel and rye because they are hearty, flavorful and firm -- even a thin slice doesn't require toasting. With the bread choice solid, it was off to the Oregon Lox Company for some sockeye salmon, then to pick up some Nancy's cream cheese, another local specialty. I've had something like this before, but never had a recipe so the day has been full of trial and error. Tasty trial and error, but still. Anyway, I think I've settled on a flavorful combo so I thought I would take a picture and share my recipe. The dill and capers are what set this apart. The shallots can be replaced with caramelized onions, but don't forget the capers. Seriously. As I count my blessings this year, I'm wishing you the happiest of Thanksgiving and Hanukkah celebrations. 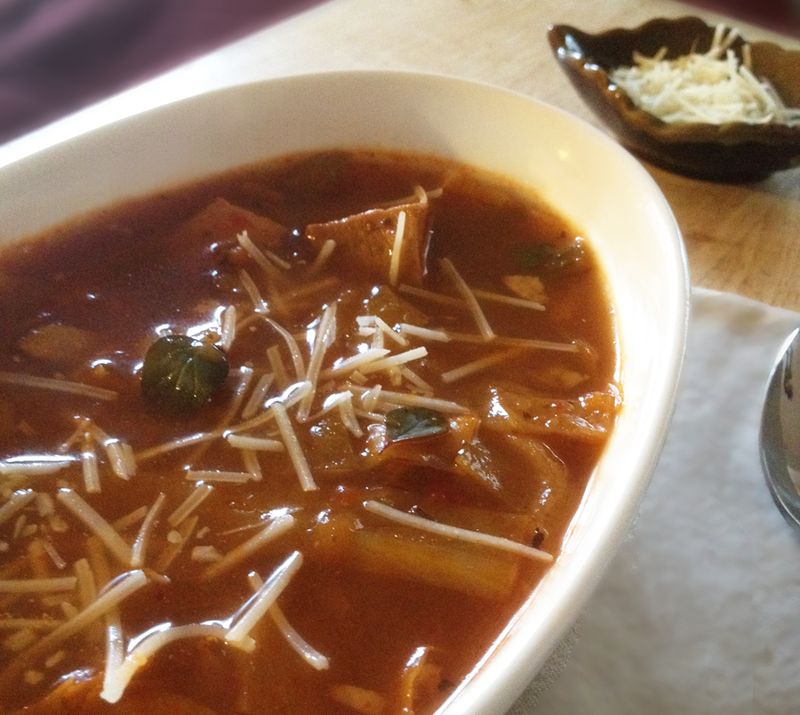 A chill is in the air and that can only mean one thing; it's time for soup! I say that like I enjoy a chill in the air (and soup). Actually, I'm not really crazy about either so I have to experiment with my favorite ingredients and hope for the best. I shouldn't be surprised that this one was popular -- anything with tomatoes, garlic and bacon usually doesn't last around here! Not only does this one go together quickly, but the flavors of tomato, shallot, garlic and Italian seasonings are deceptive. It's a light soup with the taste of a bowl of pasta! In fact, this is a great way to use leftover sauce from Sunday dinner. If you do that, omit the tomato paste and additional herbs. In the spirit of full disclosure, I have to admit that the first time I made this, I tried a new (to me anyway) product from Progresso. They're called Recipe Starters and I tried the fire roasted tomato flavor. It was really good, but because it contains sugar, cream and wheat, it might not be right for everyone. Of course there are a lot of variations, most notably without meat but I wanted to add the protein and make it a one-pot meal.